Last Wednesday I met Lynda at the Green Market again. I had a budget of ten dollars and it was really interesting to try to stick to it. We went around looking at everything first. The breads looked particularly good, and there were more cheese vendors. Some had samples so I got to try some rich, creamy butterkase and an incredibly sharp aged cheddar that was unbelievable. There were also more fruit and vegetables than that first week. The strawberries looked sweet and ripe and juicy. 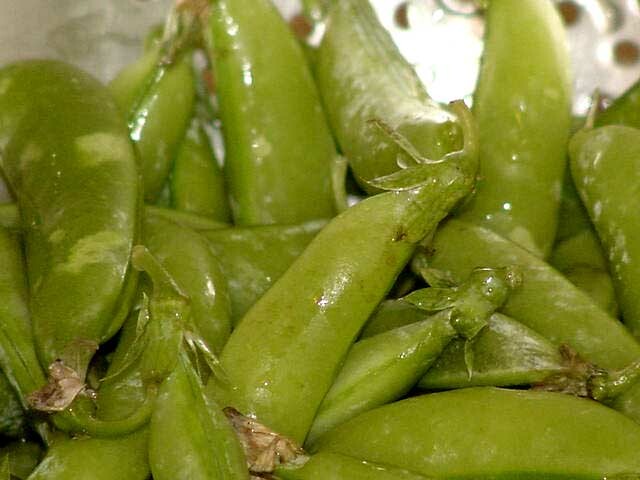 But the freshest thing there were the sugar snap peas, so I snapped up some of those. I love it when they're so sweet and tender that you can eat them shells and all. I got some Chinese broccoli and flowering onion tops as well, but those are for another post. My obsession with absorption pasta continues. It seemed like a natural accompaniment for the peas, so I figured I'd try to come up with some kind of pasta primavera-type combination. So what spices would be best for maintaining that spring-like freshness? What would give it that light breezy flavor? And fresh as a breeze the answer popped into my mind: mint. I've been reading quite a few Middle Eastern cookbooks lately and had just finished a section on mint, parsley and dill. I don't cook with it very often, but the minute it occurred to me it felt right. And to give the mint a little depth I decided to combine it with some ground fennel. The result? It was perfect. It had just the right flavor to enhance the peas, which truly were the highlight of the dish. 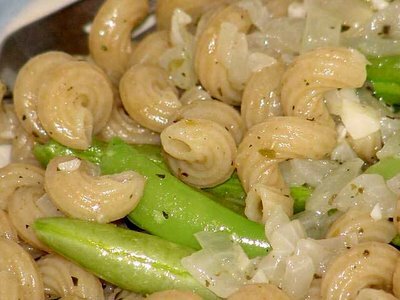 In fact, as good as it was with the pasta, I think the peas would be delicious just by themselves with a little onion, fennel and mint. For two servings, this recipe can be doubled and cooked in a 16" skillet. Heat oil in 10" skillet. Add onion and garlic and cook approximately 2 minutes, until onion is translucent. Add pasta and continue to cook, stirring constantly, for 2 more minutes. Add approximately 3/4 cup of the water, fennel, mint, salt and pepper. Lower heat, cover, and simmer for approximately 7 minutes, stirring occasionally. Add the sugar snap peas, cover, and continue to cook for 3 minutes longer, or until pasta is cooked to desired texture. On Saturday Terry and I went to the Oak Park Farmers Market and I got some of the sugar snap peas there. We just barely steamed them, and put on a just a pinch of salt and pepper.